I love risotto. I remember the first time I made it after seeing it on a cooking show on the Food Network; it was so delicious. All this fuss was made about how tricky it was to make and yet I found it simple. Yes, care has to be taken but if you pay attention to what you are doing magic happens with those little grains of rice. 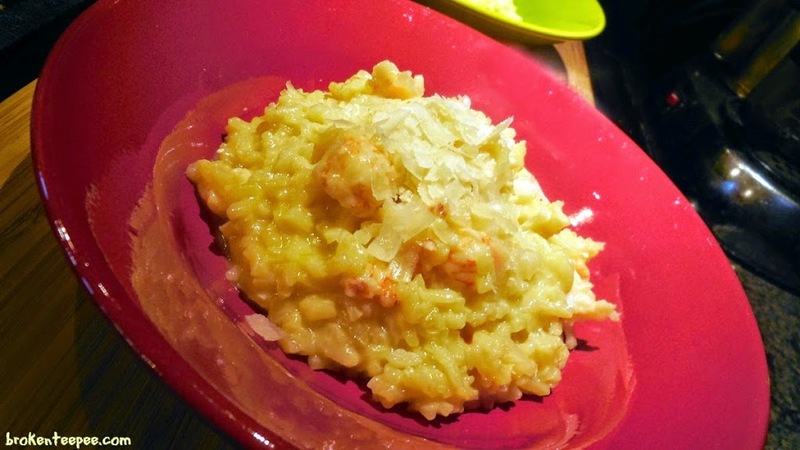 The basic recipe is simple – arborio rice, white wine, chicken stock and cheese. Plus the most important ingredient – patience. 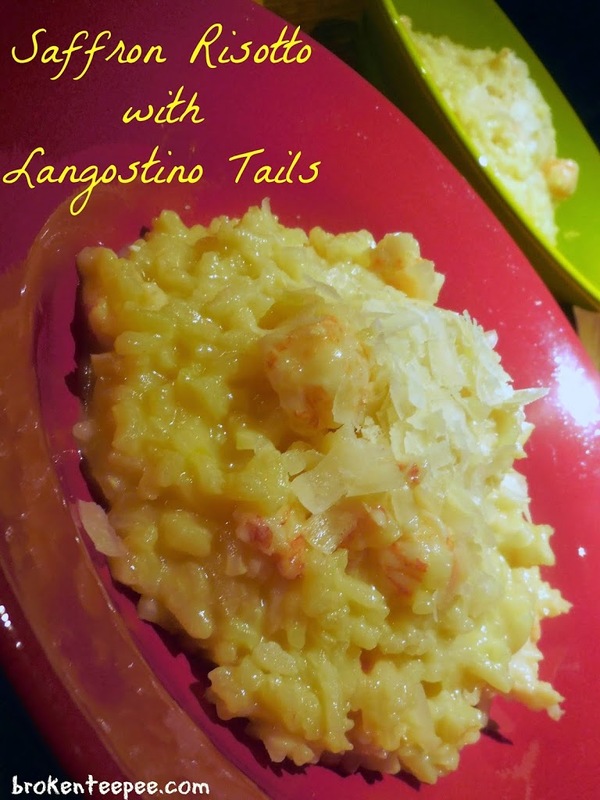 After watching that show I bought a risotto cookbook so I could learn more – it did not make the cut when we moved into the trailer mostly because once I had the basics down cooking the dish required little more than patience and my imagination. It’s a great vehicle for leftovers and it’s comfort food of the highest order. My last order to Anderson Seafoods included something I’d never had before – Chilean Langostino Tails. They come fully cooked and the description says they are similar to lobster in taste. I like to try new things and since I was placing the order this was the new thing I would try this time. I have recently seen langostino tails for sale at the Costco and I’m going to pick some up the next time I’m buying seafood. The langostino tails come in a one pound bag and I only needed half a pound for this dish. It fed us for two nights for dinners. Not bad if you ask me! I served it with the Sunomono – a delicious Japanese cucumber dish. The tart, crisp cucumbers were a perfect foil for the rich, creamy rice. Pour the chicken stock into a small pan and bring it just to a boil, lower the heat and keep it just at a simmer. Add the saffron. Place a large saute pan over med-high heat. When the pan is hot add the olive oil. Add the rice and stir it around until all of the grains are coated and starting to crackle. Add the white wine and a sprinkling of salt. Here is where the patience starts to come into play. Stir the rice and wine until the wine is all absorbed (see the third photo.) It is important that all of the liquid be absorbed by the rice before you add more. Add the hot chicken stock about a cup at a time – for me that is three ladle-fuls – stirring all the while. It will take about 20 minutes. When you have about half a cup of stock left turn the heat off under the stock. Add the Parmesan cheese and stir it in well. 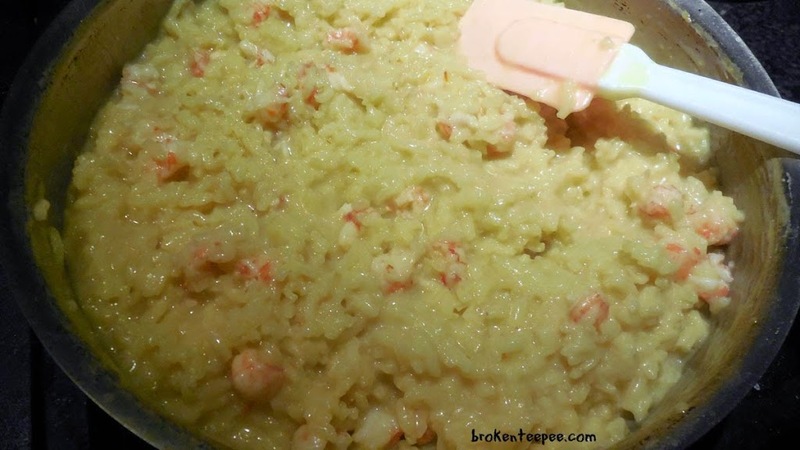 Add the butter and milk if you would like – these two ingredients are optional and they make the risotto richer. When the butter has melted stir in the langostino tails and the remaining half cup of stock. Turn off the heat and let the risotto sit for 10 minutes. When you are ready to serve taste the risotto and add salt and pepper to adjust for taste. As you can see the rest period allowed the rice to absorb the liquid. 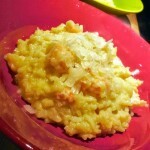 The rice will still have a bit of bite to it – it should be al dente in its creamy sauce. It was heaven in a bowl. Saffron is one of my favorite flavors – as long as it’s not too heavy. It went so well with the Langostino tails which were delightfully sweet. It was just as good on the second night when I reheated it. Place a large saute pan over med-high heat. When the pan is hot add the olive oil. Add the rice and stir it around until all of the grains are coated and starting to crackle. Add the white wine and a sprinkling of salt. Here is where the patience starts to come into play. Stir the rice and wine until the wine is all absorbed (see the third photo.) 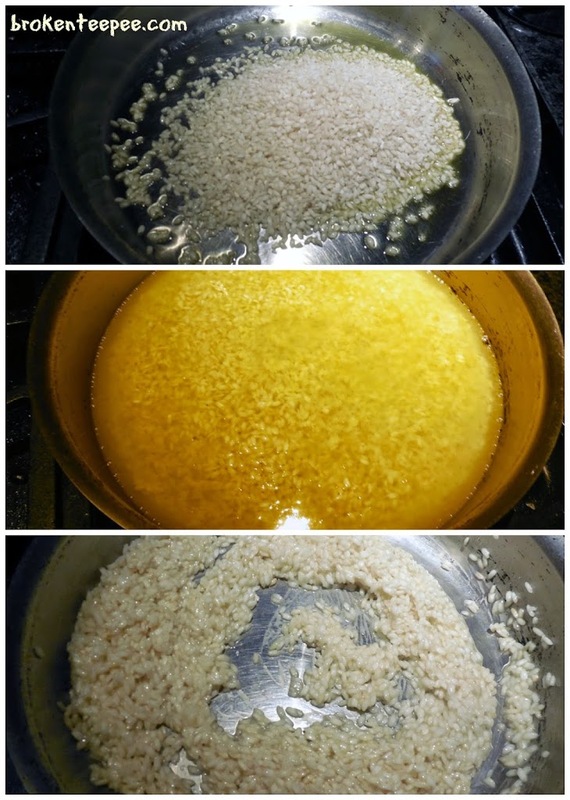 It is important that all of the liquid be absorbed by the rice before you add more. Add the hot chicken stock about a cup at a time – for me that is three ladle-fuls – stirring all the while. It will take about 20 minutes. When you have about half a cup of stock left turn the heat off under the stock. Add the Parmesan cheese and stir it in well. 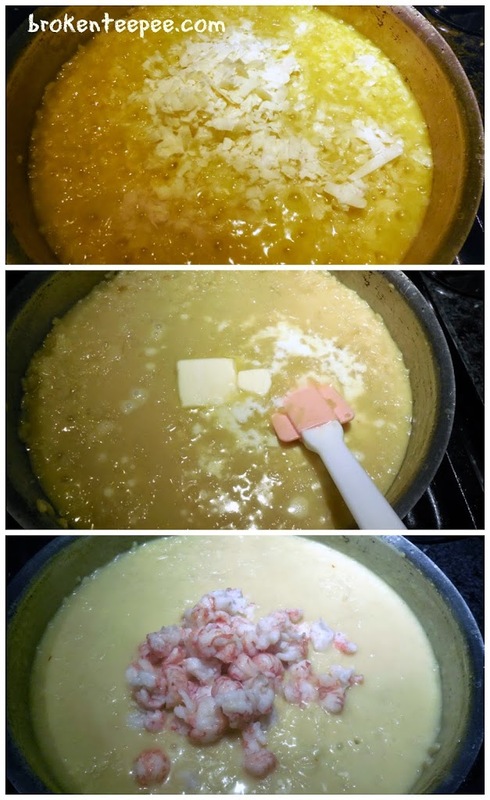 Add the butter and milk if you would like – these two ingredients are optional and they make the risotto richer. When the butter has melted stir in the langostino tails and the remaining half cup of stock. Turn off the heat and let the risotto sit for 10 minutes.